Cookies - Are They Monsters? Block or Allow? We want to make your visit to Tickleberry easy, helpful, informative and reliable. To do this efficiently it sometimes involves placing small amounts of information on your device, be it a computer, mobile phone or tablet etc. These small files are known as cookies and their purpose includes things like making a note of the pages you visited, remembering your session in the Forum (so that you don’t need to keep entering your login details), and how many people have browsed the site. These are very basic text files and cannot in any way be used to identify you personally. No. Cookies are tiny parcels of text not programmes. They are not able to be executed as code and they cannot be used to spread viruses. Are they a danger to Privacy? No. Although cookies are stored on a computer’s hard drive, they cannot access it. A cookie cannot read other information saved on the computer’s hard drive, so it unable to find email addresses, etc. Cookies contain and transfer to the server only as much information as you will allow a website to do. Some people have arrived at this webpage hoping to find out about tasty biscuits, so we’ve included our favourite cupcake recipe too! Preheat the oven to 180°C (Electric oven | Electric fan oven 160°C | Gas Mark 4) and place paper cases into a muffin tin. Using an electric whisk, food processor or wooden spoon, beat the butter and sugar until light and fluffy. Add in the egg, beating it well. Bake in the oven for 10 – 20 minutes. After 10 minutes, check to see if the cupcakes are ready by inserting a cocktail stick into one of the cupcakes. If it comes out dry then the cupcakes are done. If not, pop the cakes back in the oven for a few more minutes. Lift the cupcakes out of the muffin tin and leave to cool on a wire rack. Mix the unsalted butter, icing sugar and vanilla. Add the tablespoons of milk, one tablespoon at a time and stir in well. Take out 4-5 tablespoons of the mixture and keep in a separate bowl. Next make the coloured coconut. Add a few drops of food colouring to the coconut and coat thoroughly. Spread the coconut out on wax paper to air dry for a couple hours. 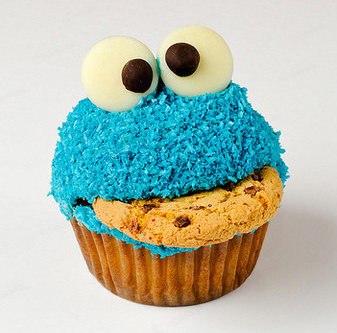 To make the coconut better resemble the Cookie Monster’s furry coat, you can pulse the coconut in a food processor. To make the eyes, pipe out two balls of white butter icing (use a baggie with the corner snipped off if you don’t have a pastry bag). Add a chocolate chip, with the flat surface facing upwards, to each ball of white butter frosting. Use a sharp knife to make a cut for the mouth and wedge in your favourite biscuit.